(Nanowerk News) A new era of electronics and even quantum devices could be ushered in with the fabrication of a virtually perfect single layer of “white graphene,” according to researchers at the Department of Energy’s Oak Ridge National Laboratory. “Imagine batteries, capacitors, solar cells, video screens and fuel cells as thin as a piece of paper,” said ORNL’s Yijing Stehle, postdoctoral associate and lead author of a paper published in Chemistry of Materials ("Synthesis of Hexagonal Boron Nitride Monolayer: Control of Nucleation and Crystal Morphology"). 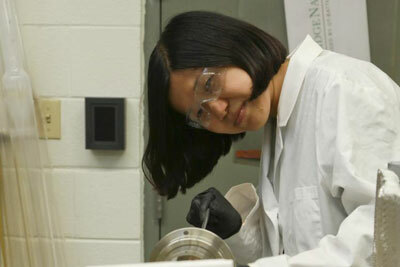 She and colleagues are also working on a graphene hexagonal boron 2-D capacitor and fuel cell prototype that are not only “super thin” but also transparent. Growth and transfer of 2-D material such as hexagonal boron nitride and graphene was performed by a team that included Yijing Stehle of Oak Ridge National Laboratory. Stehle noted that this work is especially significant because it takes the material beyond theory. A recent theoretical study led by Rice University ('White graphene' structures can take the heat ), for instance, proposed the use of white graphene to cool electronics. Stehle and colleagues have made high-quality layers of hexagonal boron nitride they believe can be cost-effectively scaled up to large production volumes.